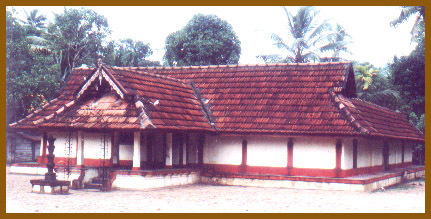 Murukkuveli Sree Bhagavati Temple is a Shakti Temples built in Purakkad during the fall of the 15th century AD. Purakkad a coastal regime of the Historical Chempakasseri Rajah, was a famous capital and a busy port widely known as Porka among the European and middle east traders of aromatics, spices, forest yealds from here. The prosperity of Purakkad continued through centuries until fall of the Chempakasseri Regime and the rise of Alleppey in its place as District Headquarters, Cultural Center and Scene of many Historical Events at the expansion of Travancore dynasty. The Murukkuveli Sree Bhagavati Temple situates on the eastern edge of the National Highway, an 18 kilometers distance southward from Alleppey. This is the only Devi Temple facing towards the sea, and has had the proximity of a couple of funeral grounds, which is a very remarkable rarity. The cause and inception of every temple is entwined with much folklore, legends, myths and faith. It is rather an amalgamation of all. Murukkuveli Sree Bhagavati Temple too is not an exception.